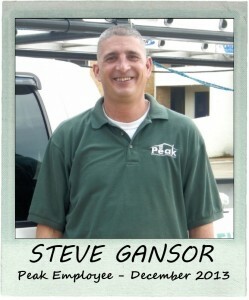 Steve has been involved with Peak Roofing Contractors since “day one”, so he is very familiar with the ups-and-downs of the construction industry! He is a loyal employee and follows procedures without fail. Steve is very thorough in his work – His attention to detail makes us wonder if he was ever a surgeon! Steve focuses his talents wherever & whenever they are needed, so don’t be surprised to see him finalizing the sales process with a Peak Roofing customer and then climbing a ladder to supervise the proper placement of their shingles! 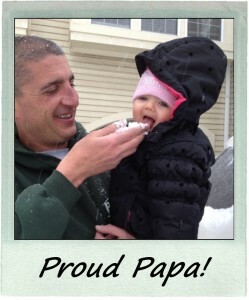 Besides being a great member of the Peak Roofing Team, earlier this year Steve welcomed a new member to his Home Team. Baby Katelynn is Steve and wife Angie’s greatest joy and they are all looking forward to a wonderful Christmas together. Peak Roofing is looking forward to a prosperous 2014 and we are happy that Steve Gansor will be helping us to create that success!